I thought I was the only mom in the world who couldn’t get it together, who wasn’t really enjoying motherhood. I felt terrible. I sat on my couch with a giant pile of laundry next to me. Another day had come and gone and I had barely been able to keep up. The days were flying by me, my kids were all under four years old, but I felt like I had missed what childhood they’d had so far. I was always cleaning up. When I thought about my days and how I spent my time, all I saw was piles of dishes, an endless mountain of laundry, picking up toys and books and markers and jackets and shoes and empty water bottles and paper artwork. I thought motherhood was going to mean I’d get to enjoy my kids. I chose stay-at-home motherhood because I felt like this is where I was supposed to be - home with my kids. It felt right. Yet, I never spent time enjoying them. I had to keep moving or the house and the day would collapse. When I did press pause and spend some time with my kids, it felt like I had to pay the price - catching up on housework; making up for the time I missed living my life. It’s not that I’m a neat freak (in fact, I’m probably pretty near the opposite). All this work was simply to keep the house functioning. I was that student in school who stays up all night studying and gets a C. That’s how I felt about my life. I was trying so hard! I felt little satisfaction, little joy, and every day was a battle for my time that I didn’t want to wake up for. But what if I wanted more than to just survive in my motherhood? That’s what I was doing now. After another particularly difficult day, I reflected on how I’d yelled, how I’d been the mom I never wanted to be, how I was counting how many hours I had of peace and quiet before morning came and I had to start over. It wasn’t like I’d had this one really tough day, but tomorrow would be a fresh start and things would get better; I was feeling like this nearly every day. This wasn’t what I wanted, and I knew I was called to more than this for my kids’ sake and my own. This wasn’t abundant life, it didn’t feel purposeful, it felt overwhelming and depressing. I decided I wasn’t going to let this be my life, and this overwhelm and depression wasn’t going to rule me any longer. What I did next set my life on a new course, and it never went back to the way it was. It changed everything. I went into the playroom - the room that was the bane of my existence. This was a room full of colorful bins, each bin full of toys. There were toys on the floor, in chests, in boxes, toys everywhere. I would send my kids in here to play and they would come out less than ten minutes later complaining of boredom. This room was pointless, and I’d had enough. Here’s an episode of The Purpose Show about this topic! I started working through the room, making piles - keep, trash, donate. I got rid of every single toy that I felt wasn’t benefitting my kids. If it didn’t cause them to engage in constructive or imaginary play, it wasn’t staying in this house because it wasn’t worth the work it caused me. If I was going to clean up it was going to be the things that added to our lives; it was going to be only the things we needed and the things we truly loved. When I was finished, all that was left was trains and tracks, a couple of dress up costumes, books, and blocks. The trunk of my car was overstuffed with toys to take to Goodwill, my playroom was purged, and I felt lighter. The next day my kids ran downstairs for breakfast, and as usual, I sent them into their playroom to play, curious to see if they would have a meltdown because of what I’d done with their toys. They walked in, looked around, said something along the lines of “hey! It’s nice and clean, Mommy! Hey! There’s my trains!” and happily started playing. I was shocked. I stepped out of the room, poured myself a cup of coffee, and sat on the couch. To my surprise, my kids played in that room that day for three hours. Three hours! It wasn’t just that day either. They continued to want to be in their playroom for long amounts of time from then on. They started going outside more often, making up stories and scenarios together, playing tag and creating art. I took my purging into other areas of the house - the dishes, the clothes, the drawers and cupboards - and our whole homelife continued to transform. I was spending less than half my time managing my house, I was playing with my kids, I took up homeschooling, my marriage even improved because I wasn’t a cranky maniac anymore. My depression lifted and never came back. Life felt lighter, intentional, and I was no longer “getting through it”. This was abundant life in motherhood; I could feel it. Today, five years later, we’ve had a fourth baby, moved cross-country to chase our dreams (very easily, because we weren’t tied down by our stuff), I started a business doing what I love and helping other women, and the housework is just a side note in my life. It’s something I have to maintain a little each day in order to serve my family and keep things running smoothly; it does not take up the bulk of my life anymore. My kids’ imaginations continue to bloom in amazing ways because there are hardly any toys in our house. They create these elaborate stories together and act them out, they get along so beautifully together, and they prefer to be outside more than anywhere else. I feel like we’re giving them an honest to goodness 1970’s childhood, and I love that. So why did de-cluttering give me so much freedom? How does losing my stuff have anything to do with my depression and general lack of joy in my motherhood? Studies show a direct link between the amount of physical possessions in a house and the stress level of the female homeowner. One study done at UCLA found that the more stuff was in a woman’s house, the higher her level of stress hormones. This same study also found that women subconsciously relate how happy they are with their homelife and family to how they feel about their homes. So the more clutter and chaos in the home, the less happy the woman is with her family and her life. Bingo. That’s what was going on with me, and I believe it’s the cause of today’s epidemic in mothers. Barely getting by, living in survival mode, feeling like their kids’ childhoods are passing them by even when they’re right there living it with them. Our stuff is literally stealing away our joy and our lives. It’s stealing the most precious thing in the world - motherhood. Minimalism is less cleaning, it’s the joy of always being ready for company to drop by without stressing out, it’s more free time to focus on your priorities, it’s enjoying your home rather than being owned by it, it’s being able to be a mom who plays rather than a mom who’s always cleaning up, it’s being a happier person. 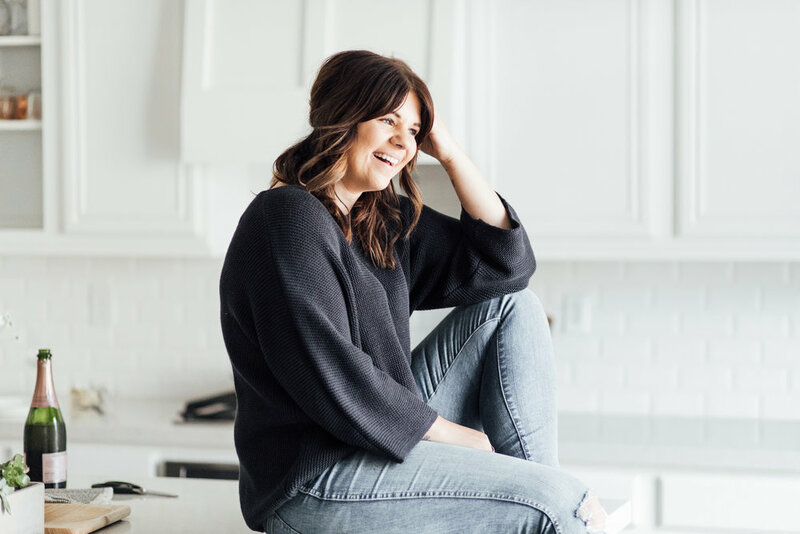 If you’re feeling ready to make some of the changes that led me to this place of thriving in motherhood and removing myself from survival mode, I’ve put together a starter kit to help you. It’s free, and you can find it by clicking here. I want this for you, sweet friend. I want you to know it doesn’t have to be like this for one more day. You can choose a different path, you can thrive, you can love this life, you can escape the chronic overwhelm that everyone else calls normal. I promise you it’s so worth it. Want to learn more about minimalism for mothers and start slow? Want to dive deep and do this in your own life?